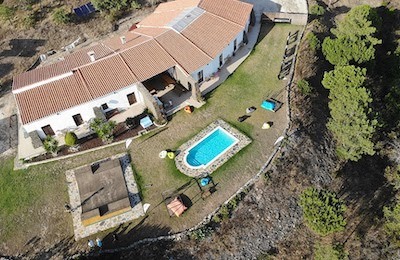 Surf and Yoga Eco Lodge Porto Portugal will be your high comfort home during your stay and is for sure a state of art. Single travelers looking for company and new friends in a shared bedroom, couples that would like a romantic surf getaway and search for double suites or groups of friends that appreciate a spacious family suite for everybody. You will find what you are looking for. Your natural flow and performance will reach new levels. Begin the days catching waves and celebrate them with a Yin Yoga Session for sunset. Best international certified teachers will guide you on your journey in the water and on the mat. The 3 brand new villas shine inside and outside with an innovative design. We handcrafted the furniture from recycled wood, so it fits the house and lifestyle of the people sharing good vibes. Feel free to use the common and kitchen for your favorite meals. Fully equipped with everything you need for a fantastic cooking session. At night we switch on the color lighting and the kitchen turns into the bar. We speak English, Portuguese, Spanish, German and French. We serve a healthy breakfast buffet with a smile. Soak up the morning sun on the outside terrace or listen to some good start music inside the cozy living space with your freshly brewed coffee. Exotic sliced fruit, orange juice, different cereals, vegan porridge, warm bread and croissants from the local bakery with honey, marmalades, Nutella, cheeses and hams, fruit infused water, cappuccino with milk or soy milk and a variety of teas. Suitable for Vegetarians, Vegans and gluten-free diet. All year round swell, comfortable water temperatures and 300 days of sunshine a year, make Portugal the perfect surf destination. Board riders with every level find something suitable to rip. Glassy peelers for long boarding and beginners, mellow right handers for intermediates or fast left handers and powerful tubes for advanced surfers. 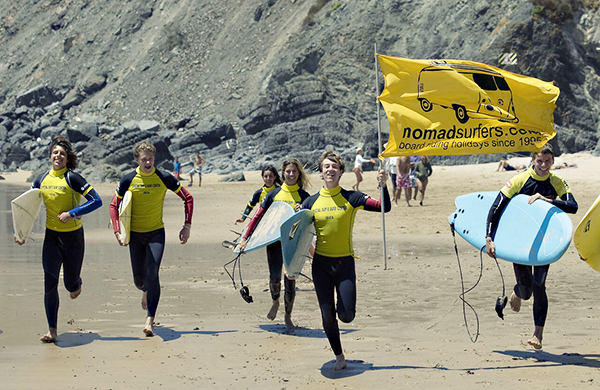 Within 15 kms of coastline, we can choose between more than 25 waves to surf. There is always an option, no matter what wind or swell directions. You will enjoy your surf sessions with our licensed local instructors. Sergio, Vitor and Alex will show you how to read the waves and the Ocean. An introduction step-by-step to the art of surfing. They are your reliable buddies in the water and you will quickly gain confidence. You will catch your first wave, and get a feeling of this passion only a surfer knows. 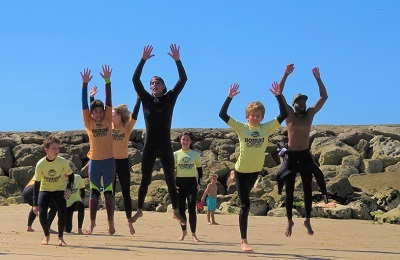 The intermediate course helps you to improve your surf skills. Built up your surf fitness, strengthen your Ocean awareness and score more waves. Develop your own flow and style. The surf instructors share their local knowledge with you and are your professional company in the line up. We do the research for you and take you where the surf is on. You will get the most out of your surf trip here, always on the right spot. Internationally well-known yoga instructors are part of our team and will bring their magic yoga style together with our exciting life by the Atlantic Ocean. Restorative Yin relax and recover practices before sunset will sooth your out-surfed body and mind. You will work on your flexibility, mindfulness and deeper breathing. This will have a huge positive impact on your surfing performance. Feel relaxed and rejuvenated. The daily practice will take place in our tasteful indoor yoga studio or under pine trees in the Natural Forest Park of Maceda. Surf and Yoga Eco Lodge Porto Portugal is just a 5 minutes walk from the beach and the charming historic center of Furadouro. There you will find everything you need from fresh local supermarkets with organic vegetables and fruits, fresh fish from the Ocean, butchers, bakeries with the famous pastéis de nata, crepes stands, homemade ice-cream parlors, strong and good Portuguese coffees, churros, shopping, pharmacy, press and ATMs. Economic restaurants and bars serving drinks and food the whole day and night, on the beach esplanade or inside. Please contact us for individual packages. We will make it happen! "I had a fantastic stay. Jessy and Sergio are very kind and attentive hosts. They do their best to make sure your stay is enjoyable and comfortable. The accommodation is modern and beautiful. The rooms are clean, large and well maintained. 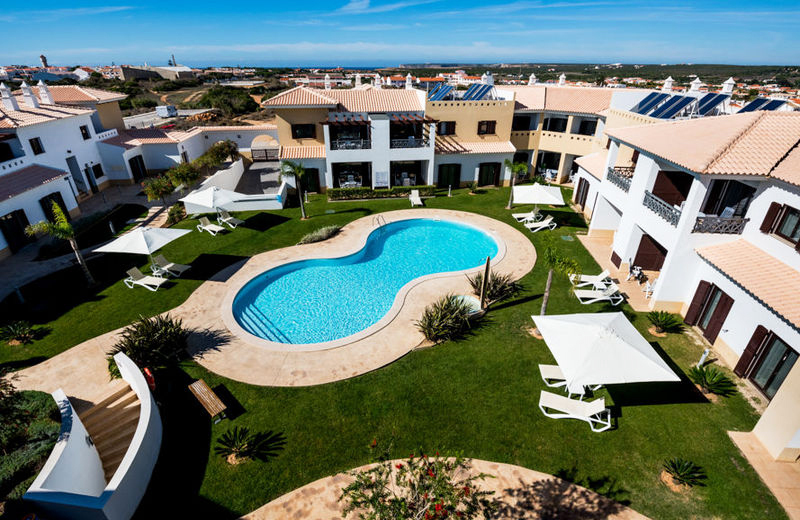 There are lots of activities to do at the Lodge such as Yoga, Surf, Tennis, Cycling and Swimming since guests have access to the leisure pool complex. Needless to say that the Instructors are amazing, too. They created a super nice learning environment. I stood up on the first day! You can find many uncrowded Surf spots around Furadouro / Esmoriz and the Yoga places we went to were just stunning. It was a perfect combination of Nature and activity, I could relax deeply and felt awesome. I didn't get the chance to properly see it, but Ovar looked cultured and interesting (a nice day out when you need a rest). All in all I had a great time and I look forward to returning in the near future. " "The combination of yoga and surf is just perfect. I liked the water time, the new material and good wetsuits to keep me warm. I liked the fact that we stayed on the beach much longer than it was included in the lessons, we just surfed until everybody was tired. I liked the calmness and flexibility that gave me the yoga in the evening.I slept like a baby." "Wow!I could really relax and calm down in this beautiful Lodge with a great team working there. Surf in crispy clear water was an amazing experience and I definitely want to keep on practicing. the extremely pleasing Yoga in the evening was my favorite time the day. The Vibe of the house is super nice, all brand new, clean, I had the best sleep ever. It is a quiet surrounding but you are quickly in the middle of the lively center. Everything is made with love and eye for the detail. The owners are super sweet and took really care of me. One night we had a barbecue on the terrace with fresh fish and Pedro from the team played fantastic Brazilian music with his guitar. The garden is great for sunbathing. Pool and Fitness center very convenient and clean. Breakfast healthy and delicious. I will never forget this trip. Definitely a place to spend awesome holidays. " "My stay at the has exceeded my expectations of a Surf and Yoga Camp. Lots of space, light, attractive design, very clean, all new. I could rest super well, comfortable beds and pleasant ambience in the house. Surf classes were spectacular! Dream beaches, fun waves, beautiful nature,new surf material and super motivated instructors. Yoga classes helped me to restore my tired muscles and the teacher Karin was very attractive;.) I liked the mountain bikes they offer to quickly ride to the supermarket. I enjoyed the lunchtimes with the surf group in authentic restaurants! I had a blast! I will definitely be back next season. "What a great place! Everything was really good, the yoga super relaxing, the surf refreshing, the staff very friendly, the rooms very nice and clean. Nothing more to say, I loved it. Jessy & Sergio are good buddies to hang around, they always have good tips for the next surf or where to eat out. I would love to come back again. " "After a rewarding day of yoga, surfing and sunbathing, nothing is better than relaxing on the comfortable sofa with a sundowner. I will definitely be back! First time I took surf classes and I instantly fell in love with this sport. The beaches were amazing! Green Pine forest, white endless atlantic sand, turquoise mellow waves just for us. Sergio motivated me a lot, as I was a bit afraid of the ocean in the beginning. These were some of my most beautiful days I ever had. "